Thirty year USPTA professional Adam Huebner and his staff offer a wide variety of tennis programs for all ages and skill levels. Our proven method of teaching will allow your children to develop the necessary skill to play the game on a social, recreational or competitive level. Our staff is committed to teaching solid basic technique for our beginners, stoke development and control for our intermediates and advanced strokes, strategy and tactics for our advanced players. 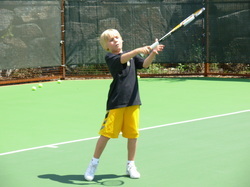 The Arizona Tennis Academy guarantees that your child will improve their skill and love for the game. These little ones will be taught the very basic tennis skills using foam tennis balls and 60 foot courts. This class is designed to spark your child's interest in tennis and we do it with lots of fun, fun, fun!!! This class is for beginners and advanced beginners using the "Quick Start" tennis balls that are softer and slightly deflated to promote ball control much quicker than the traditional ball. Participants will work on basic stroke production and consistency of all strokes incorporated into exciting individual and team games and drills to grow their love for the game. Scoring, etiquette, and basic doubles and singles strategy will also be emphasized. A tournament on December 13 will finish off the winter session with awards and prizes for all participants. A Arizona Tennis Academy T-shirt is also included in this program. This program will focus on stoke development and consistency of all strokes while participating in a variety of exciting drills and games. Students will work on basic strategic and tactical skills during singles and doubles points to improve their overall confidence in match play experience. Students must be committed to work at a high level in this class. Players will focus on stroke development, ball placement and control, consistency, and footwork while performing a variety of challenging drills and games. Specialty shots such as drop-shots, topspin lobs, half-volleys, slice forehand and backhands will also developed in this program. Dartfish video analysis will performed monthly to assist with the improvement and tracking of improvement of each stroke. Conditioning drills will be incorporated into every class for increased strength, stamina, balance and overall improvement in the performance of all strokes.